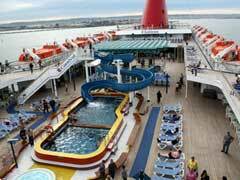 In 2009 Carnival Cruise Elation got the first half of her refurbishing, with the Serenity Deck for adults and the Circle C club for kids aged 12-14 years added. She also got a Mongolian Wok restaurant to go with the other varied eateries onboard. As she celebrates the muses who inspire the arts, her bars and clubs offer such colourful names as Gatsby’s Bar, Jekyll and Hyde Dance Club and Duke’s Piano Bar, and with two grand dining rooms, you will never run out of options. The Elation is used today on Carnival’s Western Caribbean cruise that goes to Progreso, the Yucatan and Cozumel, and with prices starting at just $249 pp. these vacations certainly qualify for the category of cheap cruises from New Orleans. The Carnival Cruise Elation’s cabins are clean and neat with 60% of them having beautiful ocean views. 408 of her cabins are of the inside variety and a very low percentage of the cabins have obstructed views. (On the Verandah Deck, 8 Jr. suites belong in this category and are located towards the bow of the ship) Some lower deck cabins have portholes instead of windows and again, are located more towards the bow of the ship. The in-cabin bathrooms are some of the largest at sea today and are equipped with showers with great water pressure, something you don’t always find on other ships, but that are a definite bonus to most cruisers. Carnival’s New Orleans cruises offer travellers a trip on a ship with a soaring atrium, teak planked decks and the patented Carnival fun atmosphere for everyone in your party. Add to this the pools, whirlpools, comedy clubs and nightly entertainment, not to mention the onboard casino and spa and you are guaranteed to never run out of things to do, unless you have planned to do nothing while onboard. Sitting, relaxing and soaking up the rays are a great way to pass the time too, and it’s your vacation, so do it your way. Carnival cruise prices always offer a lot for a little money, so maximize your vacation dollars when you choose the Carnival Cruise Elation for your next Caribbean getaway.